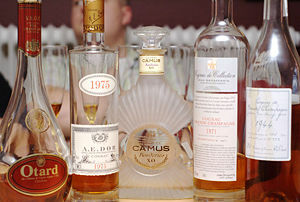 Cognac is a type of brandy made in the south west of France. True Cognac, as distinct from other types of French brandy, can only be labelled as such if it comes from a small area of western France surrounding a town called Cognac. This is because of laws that require the names of certain alcoholic products (for example, Champagne) to be used only when that product is actually produced within a specific, and legally defined, region. Cognac, which is also sometimes called eau de vie, a French term meaning "water of life", is made from a distillation of wine. This page was last modified 03:28, 4 March 2010.